He began presenting sport on Nine News in 1982 and later that year began filling in as co-host on Wide World of Sports and the Today show. After seven years with Wide World of Sports, he spent a year in 1988 as co-host of Graham Kennedy’s late night news program before taking over from Mike Gibson as host of Wide World of Sports in 1989. Nine presenter Ken Sutcliffe hosted many an Olympic and Commonwealth event. Prior to that he spent a year hosting and reporting on the America’s Cup defence in Fremantle. He was also in Los Angeles in 1984 for the Summer Olympics, then Calgary for the 1988 Winter Olympics and again to Albertville Winter Olympics in 1992, and then Lillehammer in 1994. He has also hosted three Commonwealth Games for the network: Brisbane in 1982, Auckland in 1990 and Kuala Lumpur in 1998. In addition to this he presented the Wimbledon coverage for Nine for 20 years and the US Open Tennis Championships for more than a decade. He was in Augusta, Georgia, in 1997 to host the Masters telecast when Tiger Woods broke through for his historic victory and also covered two soccer World Cups in Germany and South Africa. 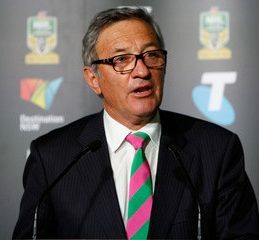 Ken Sutcliffe is an Australian icon who has retired from Channel 9 last year and is now available for speaking engagements throughout Australia and New Zealand.